But even as the Spirit produces new God-honoring desires in our life, the desires of the flesh do not disappear. This can make progress feel difficult. The apostle Paul describes the ongoing struggle: “For the desires of the flesh are against the Spirit, and the desires of the Spirit are against the flesh, for these are opposed to each other, to keep you from doing the things you want to do” (Gal. 5:17). A holy life can feel a bit like running a race. In a moment of weakness, we may stop or even take a few steps backward, but when we look to Jesus it encourages us to “lay aside every weight, and sin” and keep on going (Heb. 12:1). 3. Holiness is about becoming one of the spiritual elites. We get into trouble when we pursue Bible knowledge as a means of gaining spiritual status. Some people imagine that “godliness is a means of gain” (1 Tim. 6:5), but holiness was never meant to be about simply improving ourselves or gaining entrance into the inner circle of Christian elites. The purpose of holiness is to become more like Christ, and we grow in holiness only when we move toward Him (2 Cor. 3:18; 1 John 3:2). Jesus has set us apart through His sacrifice for sin (Heb. 10:10), and when we walk in close communion with our Holy God, we begin to act like it. But sometimes the seemingly spiritual elites among us have major character flaws, and this is the danger: If our increase in Bible knowledge does not coincide with growth in Christ-like character, something dysfunctional is happening. Puritan Thomas Watson said it well in his book The Godly Man’s Picture: “To sweat in some duties of religion and freeze in others is the symptom of a disordered Christian.” It is entirely possible for a person to be knowledgeable in the Bible and yet be ungodly. This is not what holiness looks like. 4. Holiness is produced by human willpower. This one is tricky because, as we have said, sanctification—the process of becoming holy—requires effort. However, if we think we can become holy in our own strength, we will be sadly disappointed. God is at work in our sanctification, and it is only because of His grace that we make any progress at all. Jesus prayed for His disciples, “Sanctify them in the truth” (John 17:17) because sanctification is a work of God. And if the disciples thought that they could live holy lives apart from Him, they were disabused of this notion when Jesus told them bluntly that “apart from me you can do nothing” (John 15:5). His message was clear: You must abide in Me in order to bear fruit. The Christian virtues “love, joy, peace, patience, kindness, goodness, faithfulness, gentleness, self-control” are not something that we conjure up, they are in fact, “the fruit of the Spirit” (Gal. 5:22–23). This may seem like a contradiction to my second point about sanctification requiring effort, but the reality is God’s work in sanctification and our own effort are not mutually exclusive. Or to put it another way, our effort in sanctification does not limit God’s sovereignty over it, just as God’s sovereignty does not diminish the need for our effort. In Scripture, we see both of these things happening together (e.g. 1 Corinthians 15:10). Biblical authors saw no contradiction between God’s sovereignty and human responsibility. Both are clearly there on the pages of Scripture. The reason Paul told the Philippians to “work out your salvation” is precisely because of God’s initiating grace that would enable and motivate them to obey (Phil. 2:12–13). 5. Holy people are boring. The idea that a holy person is boring makes me laugh. They are the opposite of boring; they are fearless. Take for example Sarah. She was “a holy [woman] who hoped in God” (1 Peter 3:5). And her spiritual children are not weak and mousy. No, Peter says her children “do good and do not fear anything that is frightening” (1 Peter 3:6). Our adventures may not feel as dramatic as Sarah’s—traveling to foreign lands, embroiled in royal intrigue (Gen. 12, 20), promised by God that her womb would miraculously open (Gen. 17:15–16) and the nations would be blessed through her offspring (Gen. 22:18)—but as we grow in sanctification, God makes us fit for His service. How we live today matters. Faithful living honors God and grows our capacity to take on larger responsibilities (Matt. 25:23). I am the first to admit that I have a long way to go. I have a list of fears, doubts, and insecurities, but when I see who God is making me to be, it gives me hope in Jesus Christ, not in myself. 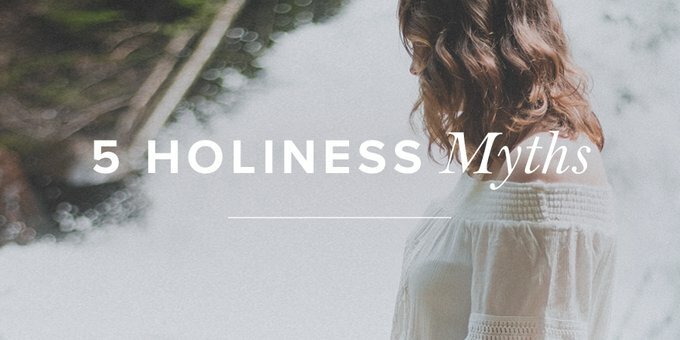 Holiness is not only for the professionals or the seemingly elite Christians among us. Holiness is for every believer. As we behold the Lord in His Word, the Spirit transforms us “into the same image from one degree of glory to another” (2 Cor. 3:18). If you are a saint, the Spirit is at work in you even now. What small effort could you make today in order to grow in holiness? Is there sin to be dealt with, God-honoring choices to be made or spiritual disciplines to pursue? Next Post What Did You Expect After Graduation?